This region of Northern California has been marked by volcanic activity for many thousands of years. The site of Mount Tehama Winery began in 1982 with 20 acres of brush and countless rocks and boulders. A Christmas tree plantation was originally established which required no pesticide application. This started the foundation for a healthy soil, and a philosophy of concern for the environment. By encouraging healthy soil and environment, we can grow healthy grapes, which improves the end product in the bottle. Terroir is a group of characteristics that are unique to a specific place that is seen in the products grown there. For instance, the terroir of wine is affected by factors related to soil, geology, climate, geomorphology, and viticulture. Previous researchers are unable to come to a consensus on which factors have the greatest affect on the wines but they all agree that all of the factors are important. This article examines the importance of the soil, in particular its grain size and mineralogy, at the Mount Tehama Winery, Manton, CA. 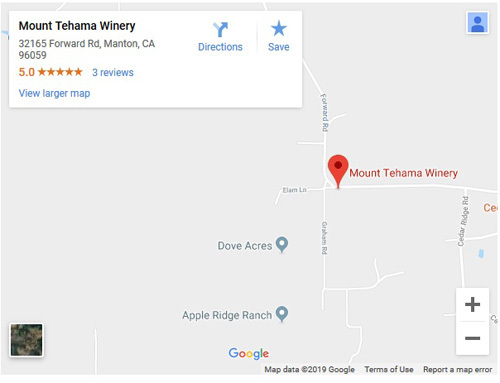 Mount Tehama Winery is located in Manton, CA, a tiny little town near Redding. Alain Teutschmann is originally from Geneva, Switzerland. As an adult, he moved to Afghanistan where he sold Middle Eastern antiques to collectors in Europe and the US. As the political scene became increasingly unstable, he moved to Manton, where he had vacationed years before. When he first bought his property, he was told that it was only good for two things, growing Christmas trees or grapes. He grew Christmas trees until 2005 and planted his first grapes, four acres of Syrah, in 2000. His original idea was to sell his grapes to a winery but finding that difficult, he decided to open his own. Over the next several years, he planted more Syrah and Petite Syrah. He currently has 5,600 vines of Syrah and Petite Syrah over 10 acres. He produces Petite Sirah, Shiraz, and Chardonnay. Mount Tehama has been certified by the California Organic Certified Farmers and is totally organic. No chemicals are used in fertilizing, protecting, and growing the grapes. Instead, natural remedies are used. For instance, if a pest is damaging the vines, Teutschmann will introduce another bug that preys on the harmful one. This is in keeping with his belief in not producing a mass market product but rather a clean, healthy product. He has based his small winery on making a good, wholesale product that is able to be sold at a reasonable price. His wines are sold in local stores and restaurants. The previous owner of the land farmed Christmas trees and did not use pesticides which have resulted in a healthy soil. Teutschmann is currently experimenting with growing other varieties of grapes. Since the vineyard is located at 2,600 ft with cold winters, he has a shorter growing season and more frost/freeze days than people think. The elevation also means that there is a 25-30°F difference in temperatures between day and night. So far he has tried merlot and zinfandel which has not worked well. One option he is looking into is grafting some different grapes onto established root systems of hardier grape varieties. Another problem is lack of consistent precipitation during the growing season. The soil is what Teutschmann calls a 3 day soil where the first and second day after a rain the soil is just right and on the third day it becomes too dry. This means that he irrigates every 7-10 days. He also mixes local red cinders into the soil where each vine is planted in order to provide a more mixed soil composition. The soil is volcanic in origin and is likely to be from the andesite and dacites lavas that formed the nearby volcanoes of Mount Lassen and Mount Shasta. The landscape in the region has been heavily influenced by the formation of the Cascade Volcanic Range and the glacial erosion of the volcanic peaks. The soils are likely a result of eroded volcanic material that was transported from the volcanoes by hydrological processes and wind. The soils are also thicker than expected for the age of the volcanic edifices, a result of the accelerated weathering due to the large amounts of snowfall/melt and wide range in temperatures. Teutschmann believes that the red cinders that are added to each vine is from an explosive eruption of one of the nearby volcanoes. Soil samples were collected with the owner's permission at Mount Tehama Winery. The soil was bright red with a large amount of pebble and boulders scattered around. They had most of the largest boulders cleared from the vineyard. The soil was also ripped down to 6 feet in depth in order to break up and mix the hard rock and soil layers. This has resulted in a uniform soil. The soil was very hard and compact, making it difficult to get a deep soil pit. The soil sample was collected from between rows of grapes in a pit —0.5 m deep. Organic material such as rootlets was incorporated into the soil sample, most were removed. After collection, the soil was dried overnight in a drying oven. A subset of the soil was than sieved in order to determine grain size. An automatic sieve was used with sizes of 9.5 mm (small cobbles), 6.7 mm (large gravel), 4.75 mm (gravel), 1.00 mm (coarse sand), 600 pm (medium sand), 53 p.m (silt), and <53 p.m (clay). Table 1 shows the grain size separation. Approximately 3 g of each of the grain size subsets in addition to a sample of unsorted material was powered in a micronizing mill and 1 g was mounted and analyzed with a Bruker D8 Focus X-ray Diffractometer. This provided the mineralogy of each grain size sample. Table 2 shows the minerals found in each sample. 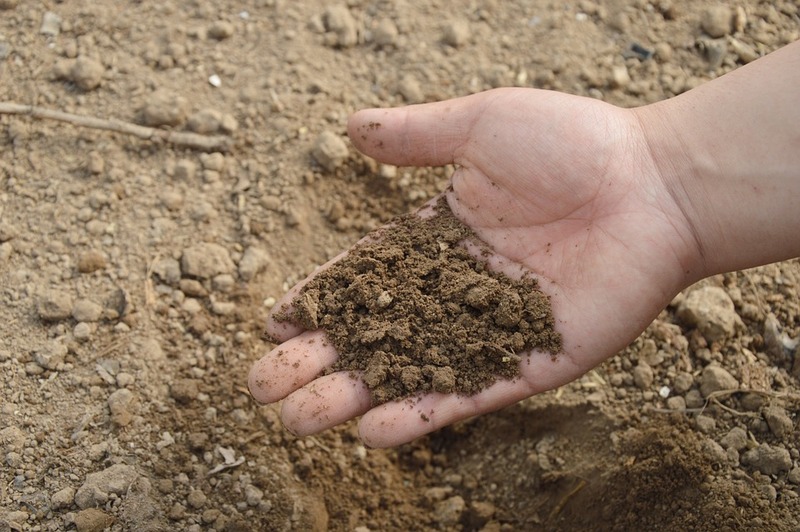 Soils are generally classified by comparing the amount of clay, silt, and sand. The soil from Mount Tehama Winery consists of 8.82% clay, 28.52% silt, and 62.66% sand. This classifies the soil as a sand clay loam. This means that there is a lot of sand allowing drainage and only a small amount of clays. Clays hold onto moisture, allowing the roots of the grape vines to extract water from the soil during dry seasons. However, with this unbalanced mixture of clay and sand, it is no surprise that the vineyard has to be irrigated. Another problem is that this soil is so hard and thick that it is very difficult for the roots to easily penetrate into the underlying bedrock which could supply needed water and nutrients. It is common for volcanic soils to be nutrient poor and many vineyards that follow new world viticultural techniques add nutrients to the soils until they have adjusted it to their specifications. However, Teutschmann is reluctant to take this step. He worries that it will affect the organic standing or alter the taste of the wine too much. However, he does make extensive use of irrigation during the summer growing season. It is possible to see that this soil is derived from volcanic materials based on the observed mineralogy. Plagioclase, pyroxene, olivine are found in almost all the samples and these are typical minerals found in volcanic rocks. The most common minerals that are not basic rock forming minerals are antigorite, gismondine. Antigorite is a serpentine group mineral and gismondine is a zeolite mineral. Both of these are common alteration minerals. Phillipsite is another zeolite, clinochlore is a chlorite group phyllosilicate, kaolinite and nacrite are clays. All of these minerals form from the alteration of minerals such as plagioclase. Therefore, it is expected to see such alteration minerals in a soil. It is interesting to see that the most representative sample is the 6.7 mm grain size. This size has most of the alteration minerals. However, none of the sample sizes, including the unsorted sample, contains every single mineral. This shows that it is important to analysis all of the grain sizes rather than just the smallest clay size fraction. The soil at Mount Tehama Winery is a sandy clay loam. It consists of igneous rock forming minerals such as plagioclase and pyroxene, and alteration minerals such as clays and zeolites. This is to be expected as the soil is weathered from the material produced during the eruption of Mount Lassen. It is understandable that they have to irrigate the vines because the amount of clay in the soil is very small, meaning that only a small amount of water is held in the soil. In order to solve their drainage issue, they could mix in some clay size soils to increase the amount of water held in the soil. However, they would need to be very careful about where they got the clay in order to not change the taste of the wine. They would also need to make sure that the clay was organic. Aside from the issues with water retention and drainage, the volcanic soil appears to be producing a good wine. 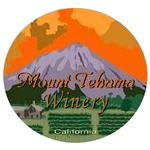 In 2008, Mount Tehama Winery entered the International Green Wine competition and won, one of the wines placed third. Teutschmann believes that following an organic farming plan will produce the best tasting, healthiest wine possible. Lassen Volcanic National park is a popular destination for tourists, and volcanic activity is still visible in the area. 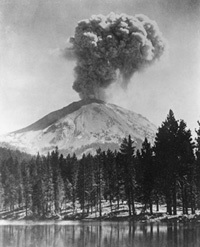 Mt Lassen itself last erupted - in spectactular fashion - on 22 May 1915. The area where Mt Lassen stands today was once dominated by mighty Mt Tehama. Our 2,660 ft. elevation gives us a colder climate, which discourages many pests and other types of problems, but is desirable in producing a balanced wine.